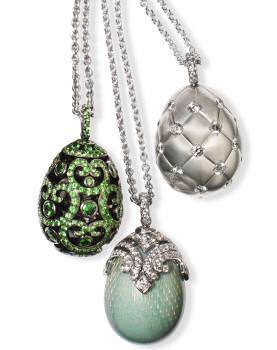 For Mother’s Day, Fabergé enchants with Les Favorites de Fabergé, a collection of timeless egg pendant treasures to pass from generation to generation. The Oeuf Nina expresses delicate feminine charm and is offered in soft coral pink and rich bottle green with either white or yellow gold immaculately enamelled over guilloché engraving, and ornamented with a delicate floral motif traced in white diamonds. The Oeuf Duchess Impératrice also offers an array of intense colour in emerald green, regal blue and crimson pink set in white or rose gold with diamonds. 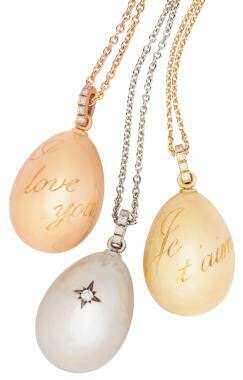 The egg design interprets the playful rococo style, a favourite influence and inspiration to Peter Carl Fabergé. The Oeuf Spirale involves a fluid, linear design echoing the beauty of nature. The Spirale is available in a rose gold with diamonds, or white gold with diamonds. For a personal touch and the ultimate treasured keepsake, Fabergé offers a limited edition collection of fine gold egg pendants with endearing personalised messages. Fabergé collections are available from the Fabergé website, Fabergé boutiques in London, Geneva and Hong Kong, and from Harrods in Knightsbridge.